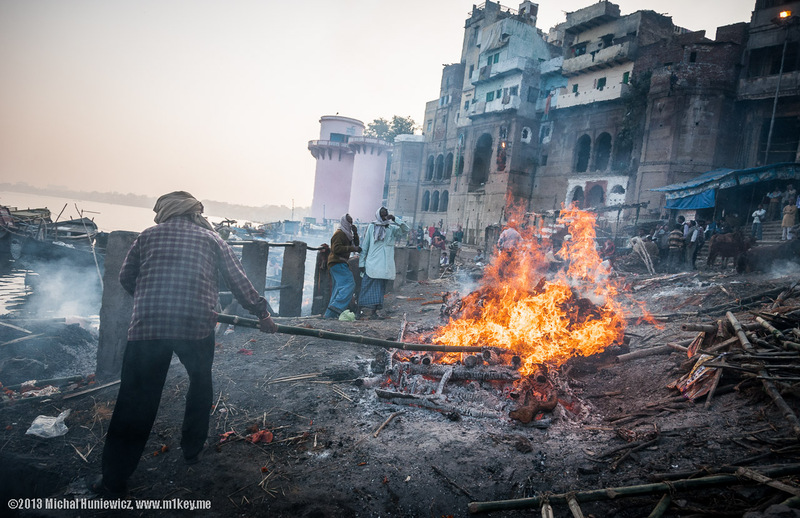 While in Varanasi, I could not miss Manikarnika Ghat, also known as the Burning Ghat, where bodies of Hindus have been cremated for thousands of years. 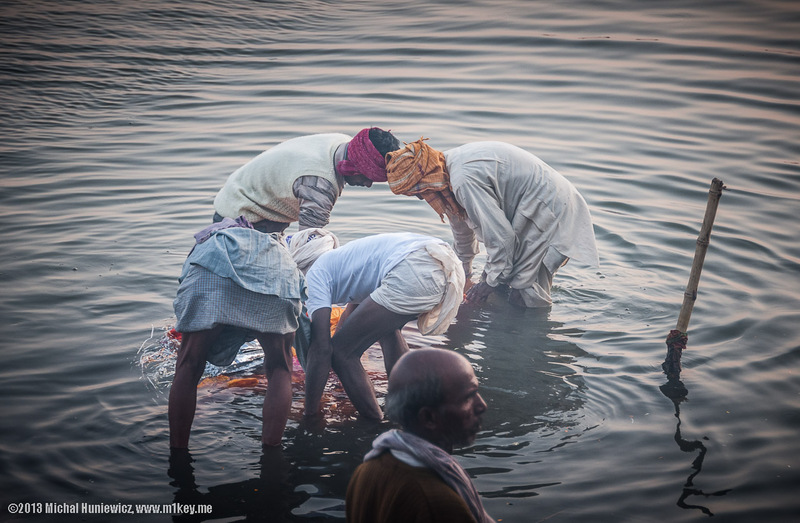 The pictures show you the last hours of a human body, the Hindu way, after it enters the Ghat to the moment it ceases to exist. While preparing the gallery, I read the ancient Garuda Purana, a sacred text that is only supposed to be read when preparing for a funeral - otherwise it's inauspicious, unlucky. It was a great read though (quite psychedelic, too) and provided me with useful information. 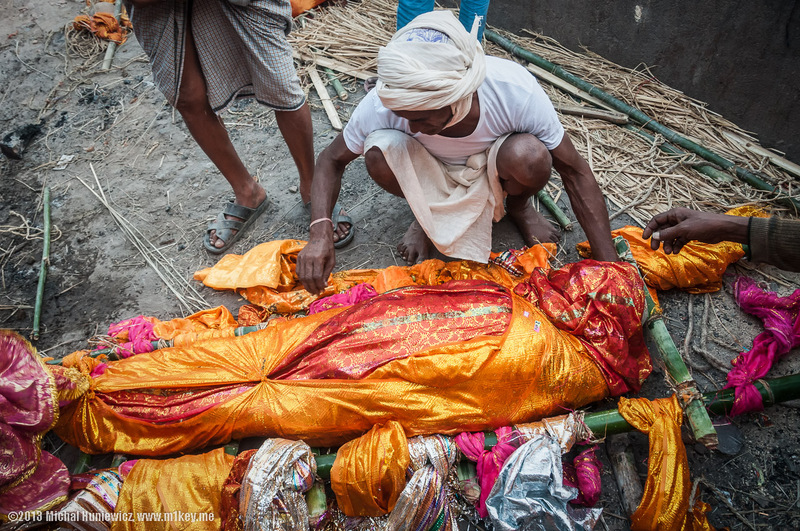 Although arranged in a logical order, the photos actually show a couple of different bodies in different stages of the ritual. Thanks to Ammar Hassan (captions). Sources: 1, 2, 3, 4, 5, 6, 7, 8, 9, 10, 11, 12, 13, 14, 15, 16, 17, 18, 19, 20, 21. 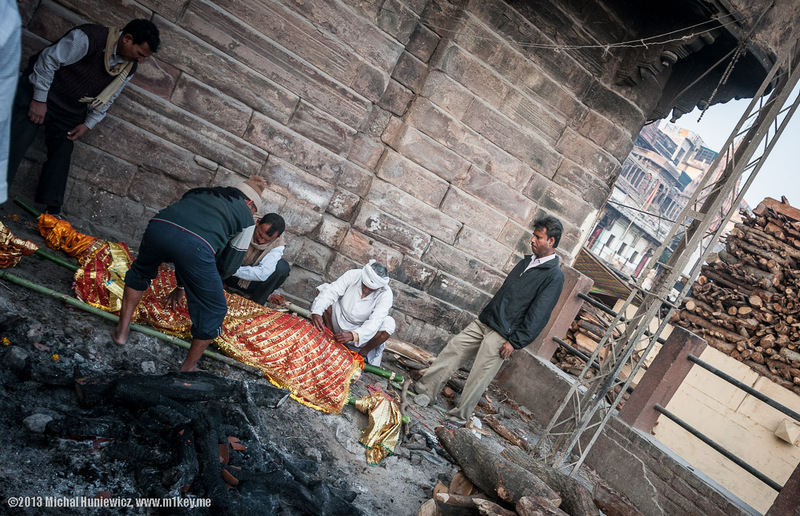 This is Manikarnika Ghat, the primary cremation ghat in Varanasi (another, smaller one exists as well). Before entering, tourists are asked to show respect, including not listening to music - I was told to put my earphones in my backpack. 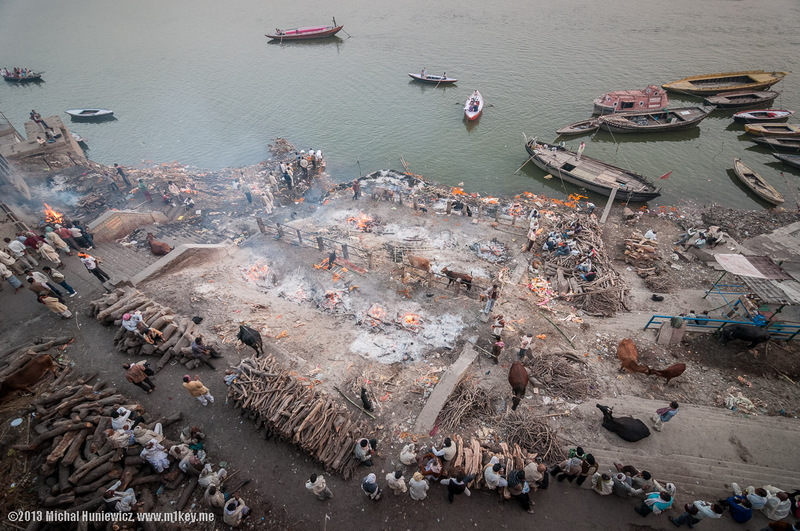 Notice the piles of wood for burning, relaxed cows and goats, family members and spectators observing the cremations, and a couple of boats with tourists. ISO 1000, 11mm, f/5.0, 1/125s. 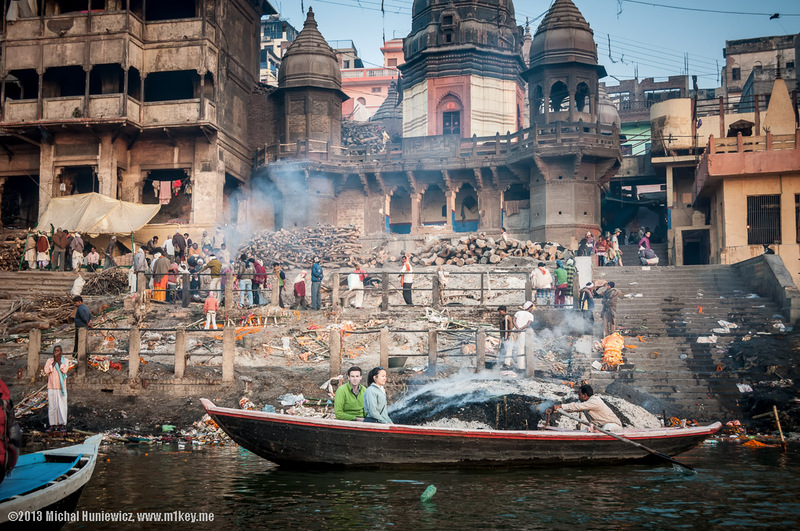 This is how most tourists experience the Burning Ghat - from a boat on the Ganges, in relative proximity to the site. Some, as these ones, choose not to look. Just behind them there is a large heap of still hot human ashes. 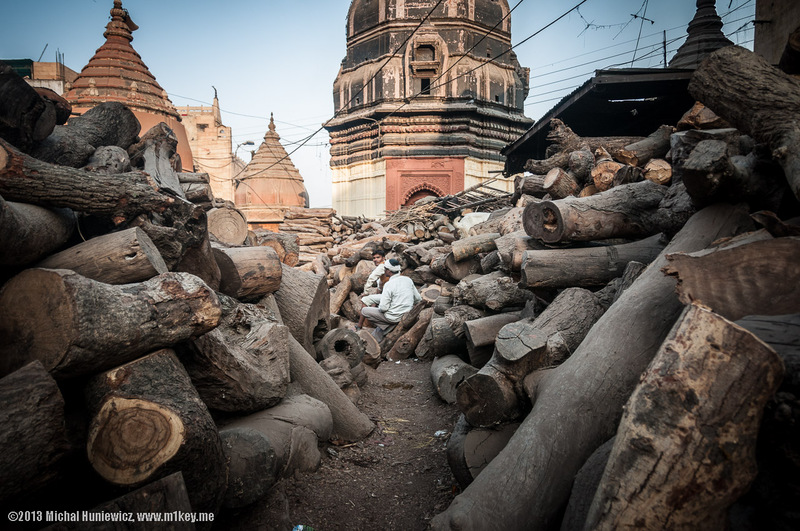 I was told that in some of the buildings in the back poor and sick people lived, awaiting their death and cremation, but visiting was not allowed due to the risk of contracting a disease. 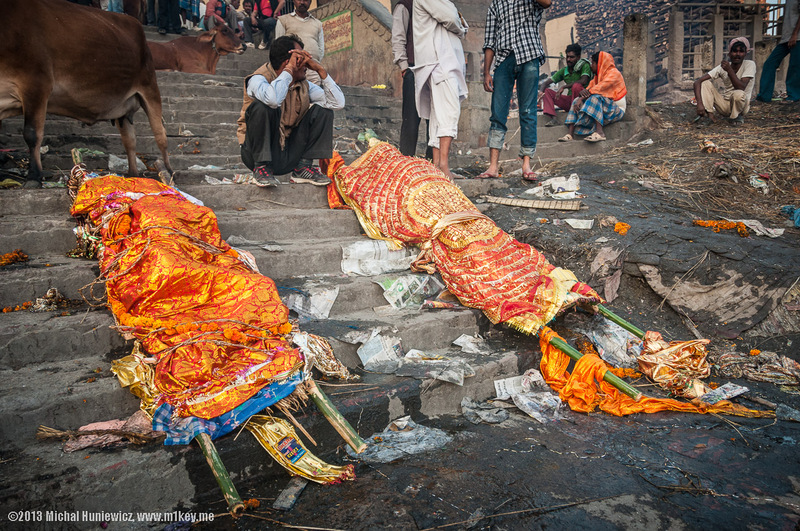 Notice the body on a bier and wrapped in an orange shroud, drying on the stairs after being immersed in the river. ISO 280, 29mm, f/6.3, 1/125s. Here we are, back on the shore. 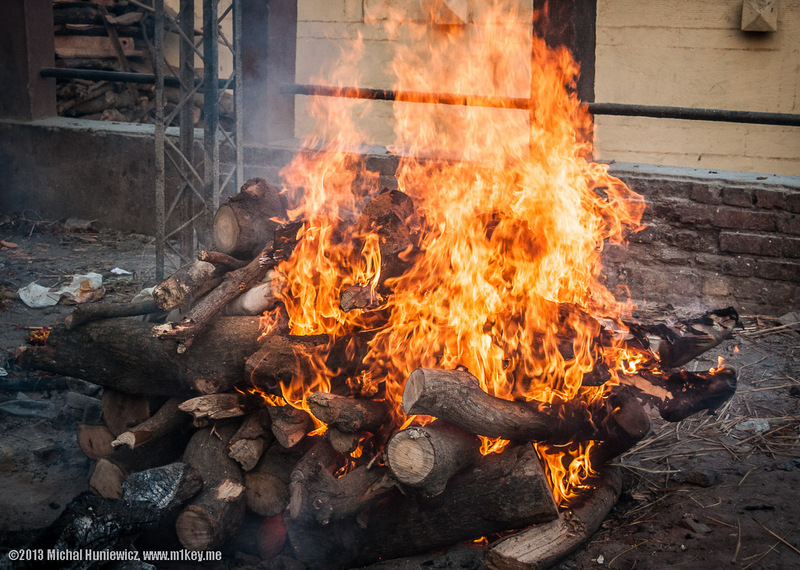 What you see in the picture are countless logs of relatively cheap wood (mango wood that is, as opposed to sandalwood) used for burning human bodies. 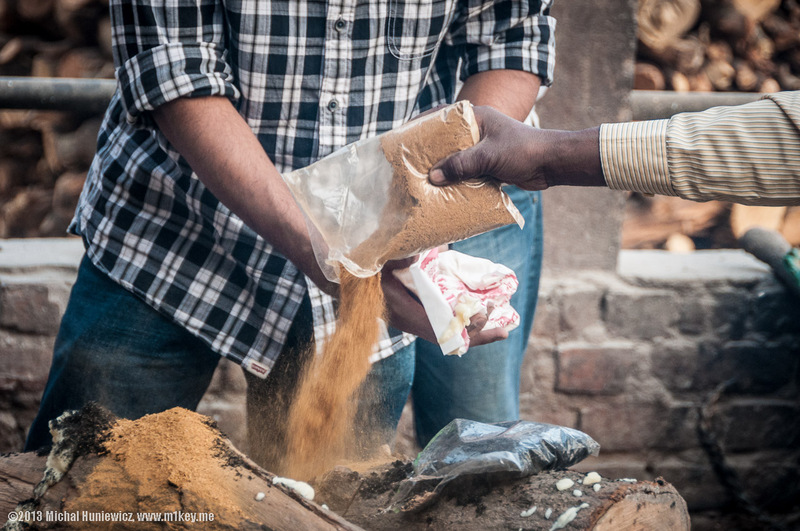 However, since about 9 million people die in India annually , for practical reasons other methods of cremations are being introduced that utilise electricity or gas instead. 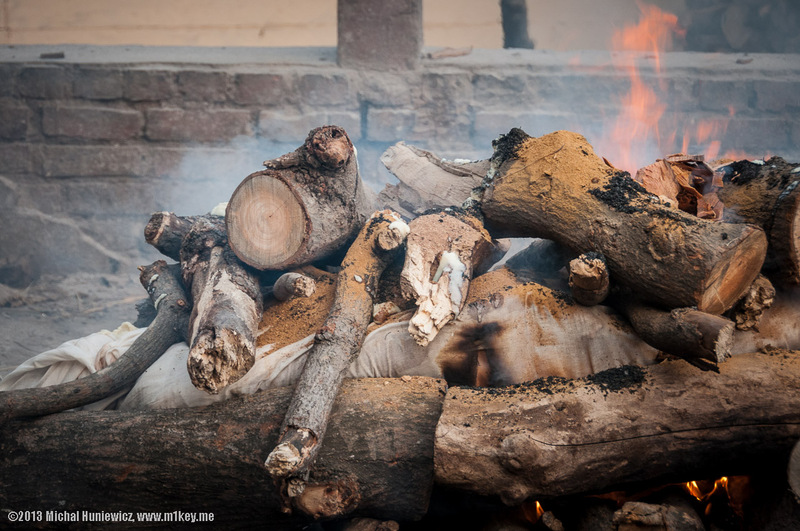 A typical funeral pyre requires 300 kilograms of wood to burn the body sufficiently , although, as we will see, not everything is reduced to ashes. 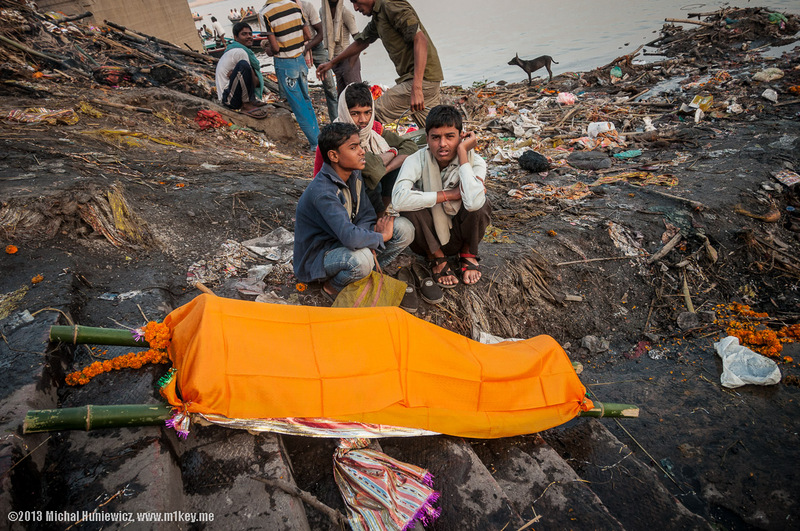 A body is taken down to the Ganges on a bier, wrapped in an orange shroud. 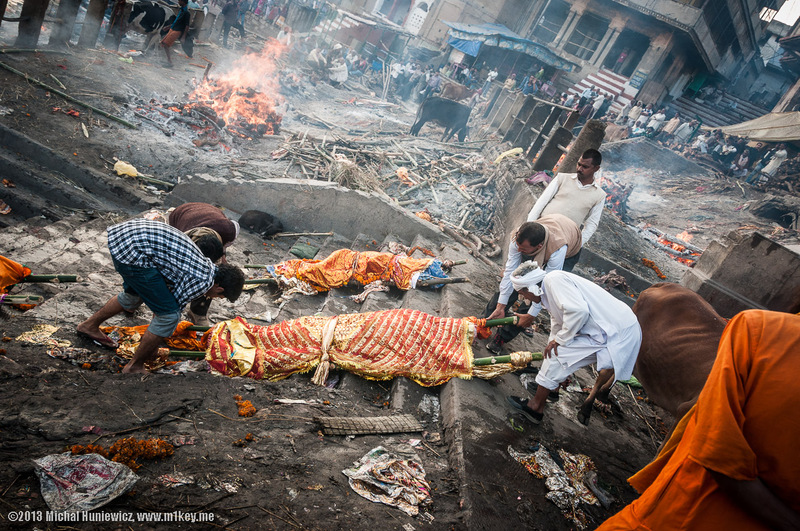 Because a body should be burnt within 24 hours from death, you'll see quite a few carts and bundles in Varanasi - those are often dead bodies taken to either of the burning ghats. My friends saw one that was accidentally pushed, and that caused a dead arm to slip outside through the sheets. 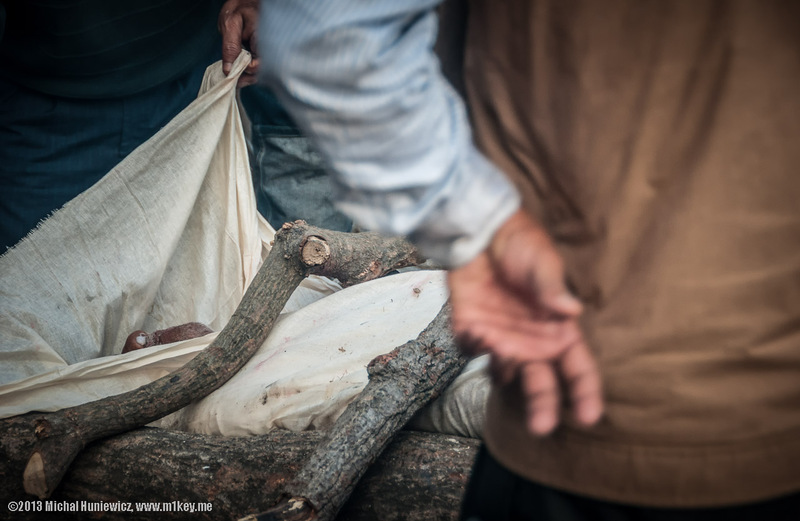 The custom of cremation might be more than 4 thousand years old, but it is unclear how and when it came about in the first place. 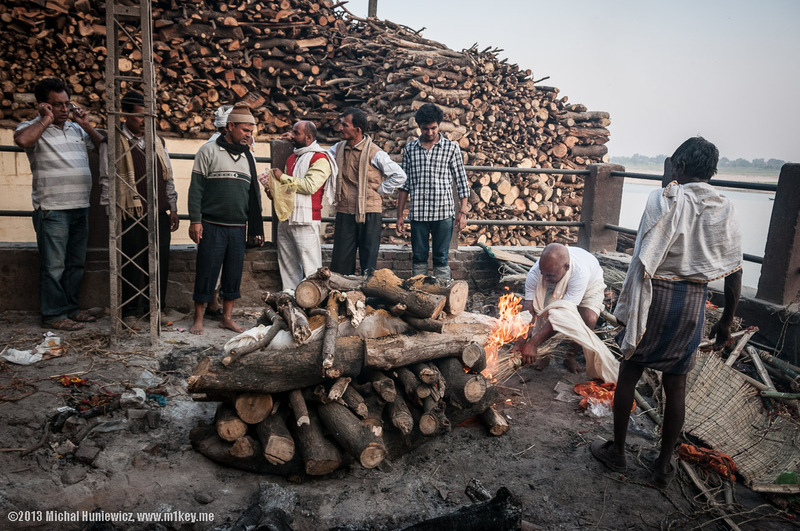 At Manikarnika Ghat, I was told that the fire used for cremations in Varanasi has been burning constantly for about 3 thousand years. 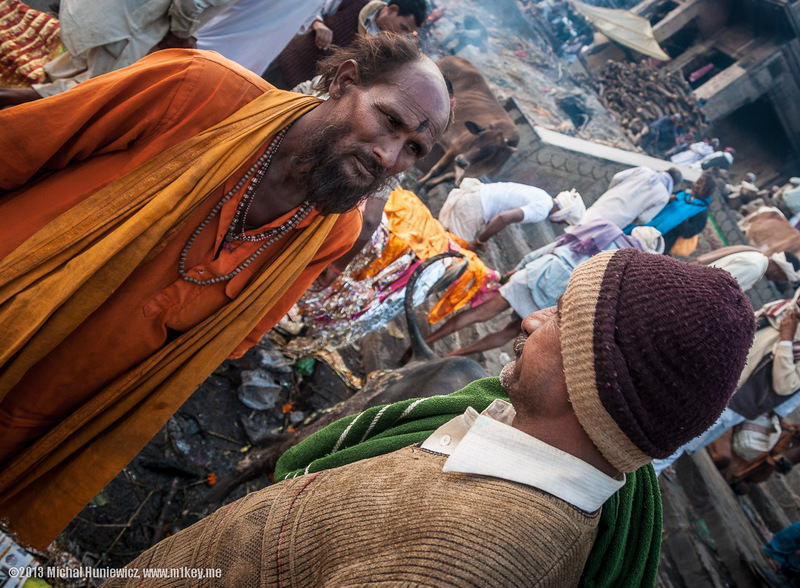 An old woman in the ghat area (in one of the buildings where women were allowed) touched the ash produced by that very fire, and smeared it on my forehead while whispering a prayer. Even a modern cremation site I visited in Jaipur allowed no women inside, and the only ones were indeed a deceased lady and one of my travel companions - as I mentioned before in my Highlights from India gallery, those gender-related rules and traditions usually don't apply to foreign women (just as it is the case in the Middle East). Smoke from the steaming pile of human ashes, which is located to the right. The body before being immersed in the river. 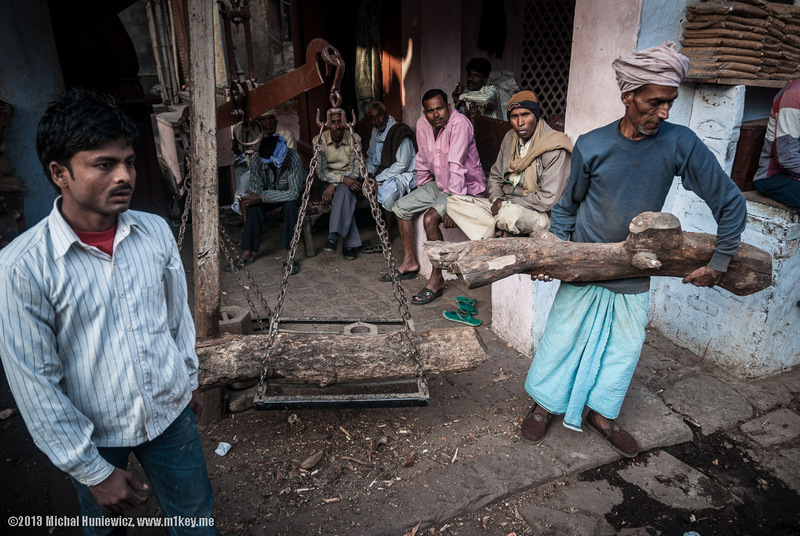 It is the family members that take it to the Ganges on a bamboo bier. The one in white is the closest male relative. ISO 200, 34mm, f/4.2, 1/320s. This only takes a couple of seconds, the body is then taken out. ISO 200, 105mm, f/5.3, 1/200s. Afterwards, the body is taken back onto the stairs. ISO 200, 18mm, f/5.0, 1/200s. It is on the stairs where it is left for about 2 hours to dry, sometimes left on its own, and then surrounded by cows or goats that nibble on the flowers - and even urinate on the body, which I saw with my own eyes. It doesn't seem to bother anyone. Two men standing in silence as a body is put on the stairs to dry. ISO 280, 18mm, f/5.0, 1/125s. Notice the body on the left is lying on the side. 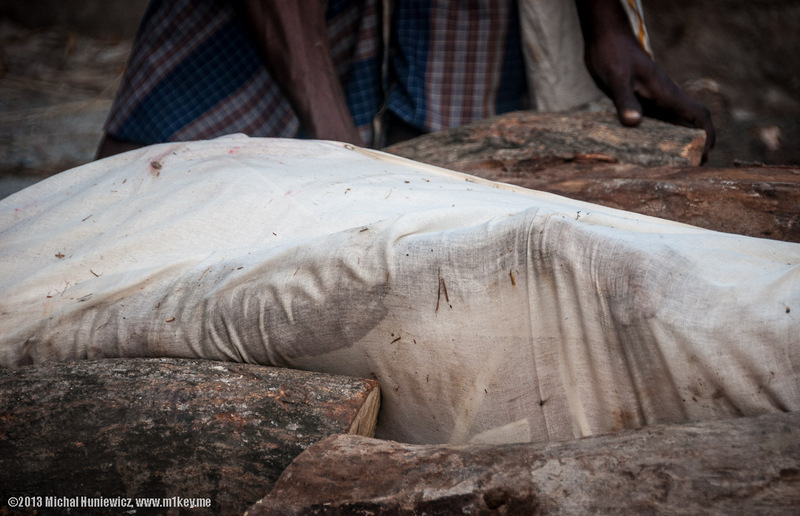 This body is now sufficiently dry, and is about to be taken by the family members to the burning pit. 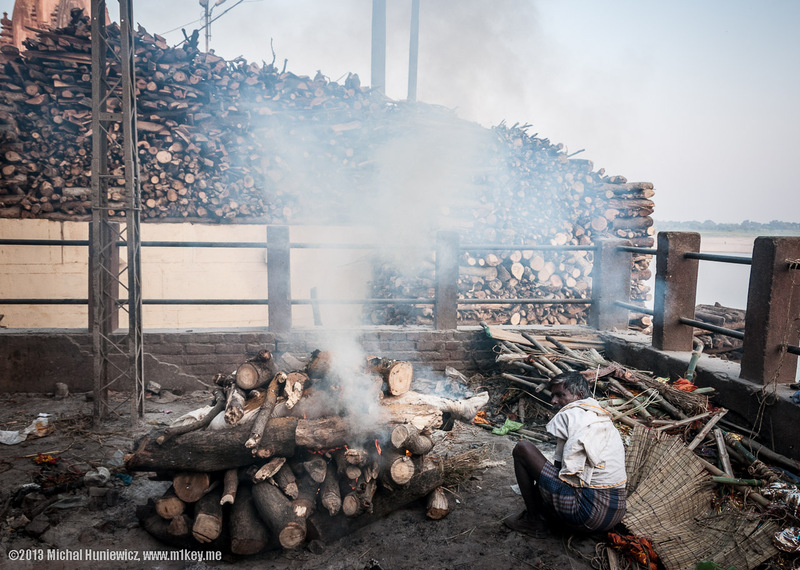 The burning pits are located on four different levels, one for each caste (I have briefly described Indian castes in my Highlights from India gallery). The people in the picture are from the Kshatriya (warrior) caste. ISO 560, 18mm, f/5.0, 1/125s. 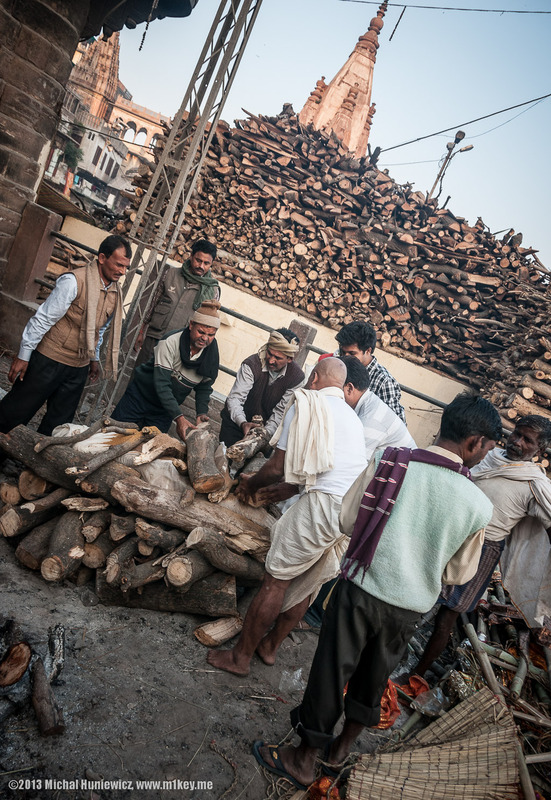 The Doms charge for the cremation itself, but also take a cut from the wood sold near the ghats. As you can imagine, the price of the wood there is very high. Since they are the only ones allowed to perform the cremations, the Doms have effectively established a monopoly, and have become wealthy. 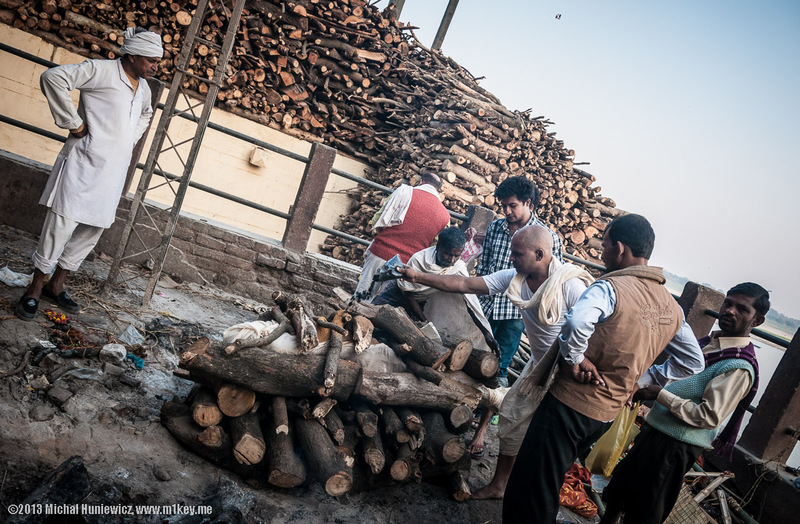 The bodies are burnt with whatever wood the family can afford, and if it's not enough, the body remains half-burnt. It is even said that the wealthiest man in Varanasi was a Dom (at least in the eighties) [Geoffrey Ward, Smithsonian magazine, September 1985]. 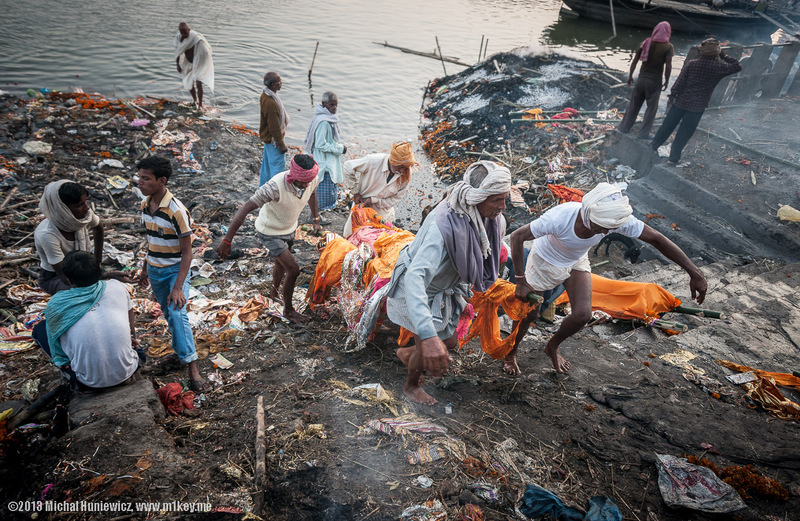 His is the other burning ghat though - Harischandra Ghat. He doesn't own Manikarnika - "Manikarnika belongs to Shiva" . ISO 500, 40mm, f/5.0, 1/125s. 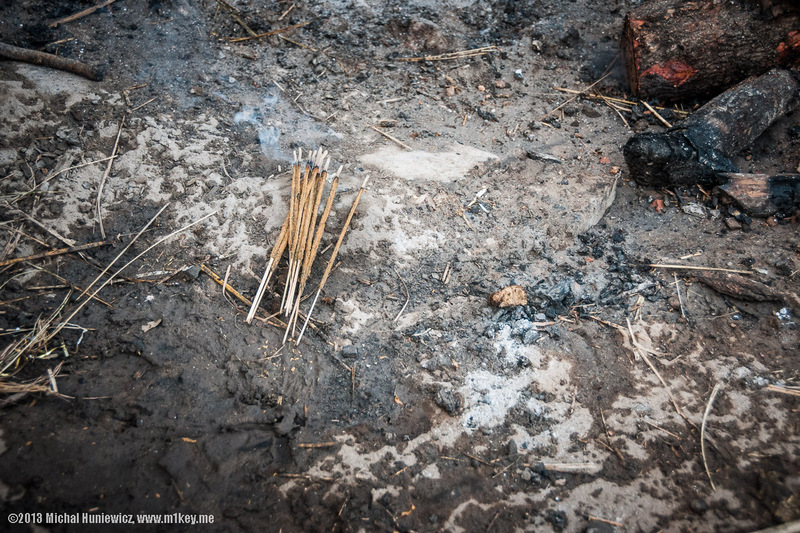 Joss sticks burning at the cremation site. ISO 1100, 38mm, f/5.0, 1/125s. 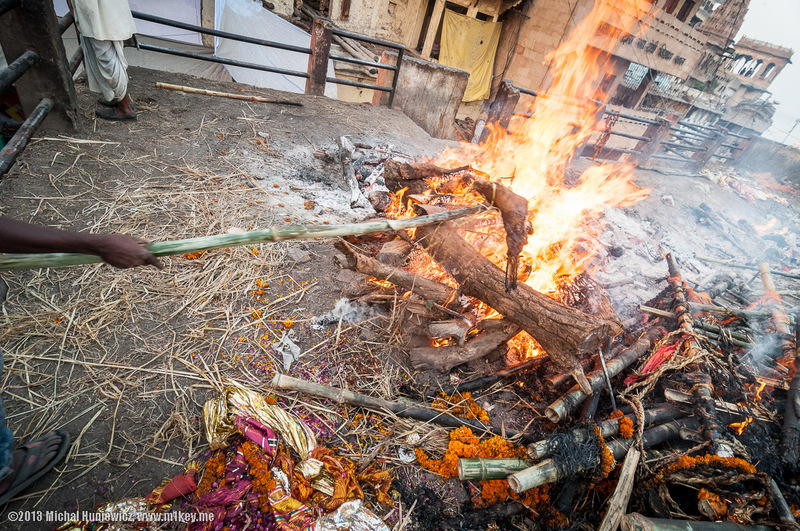 The body is freed from the rope and ready to be placed on the pyre. ISO 360, 24mm, f/5.0, 1/125s. 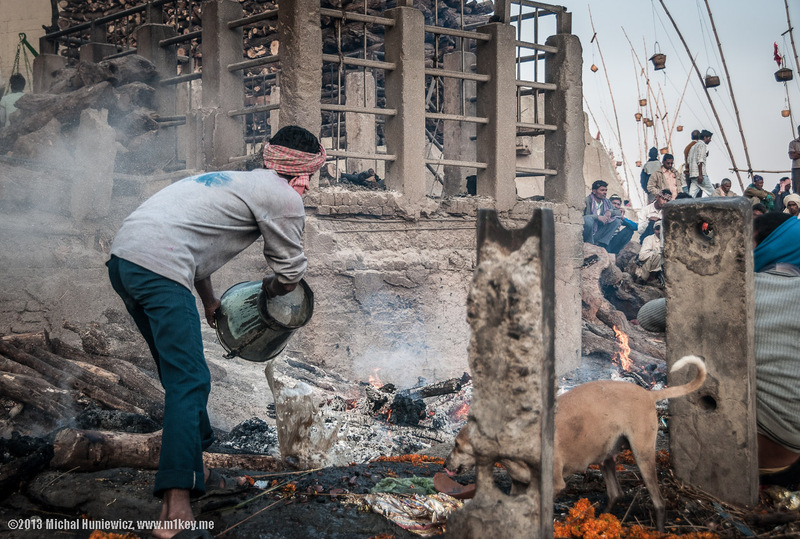 Notice the Dom has now appeared, and is standing in the background; also, see the two men on the right holding bags with various substances to be added to the pyre a few moments later. ISO 200, 24mm, f/5.0, 1/160s. ISO 200, 130mm, f/5.6, 1/160s. The content of this image may be considered objectionable by some. Click here to see it anyway. The relatives have one final look at their deceased family member's face. The cotton balls were placed in body cavities to prevent it from leaking. ISO 200, 90mm, f/5.3, 1/125s. 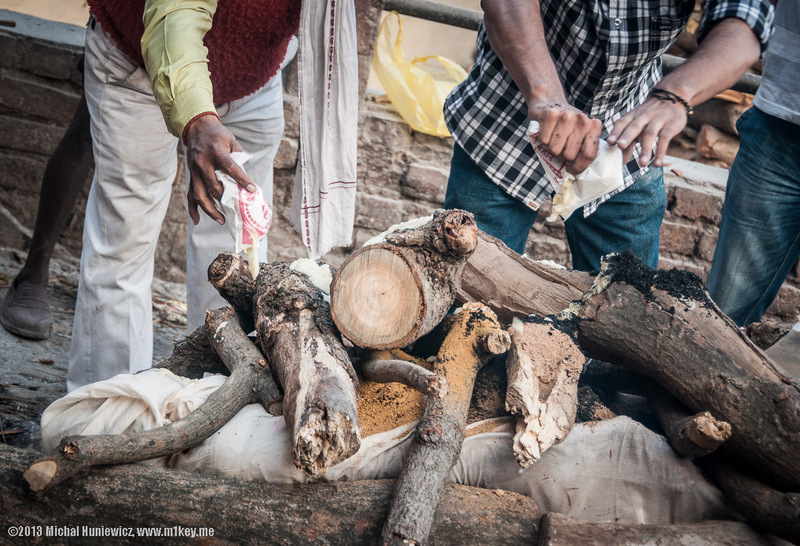 As previously mentioned, the wood most commonly used for cremations is mango wood, as it is affordable. More wealthy families may choose to use the much more expensive sandalwood instead. The poorest on the other hand may just use cow dung, and some simply throw the body directly into the river. This is most likely incense, could be black musk from Nepal, but I am not exactly sure. Note the kite in the sky. ISO 280, 56mm, f/5.0, 1/125s. Sandalwood powder cancels the smell of burning hair. The place indeed does not have an unpleasant smell, which, I noticed, was a source of pride for some of the workers. ISO 450, 105mm, f/5.3, 1/125s. The man setting the fire is probably the eldest son (the closest male relative). His head is shaved and he is wearing white our of respect. Suddenly... a cloud of smoke is released from the pyre. The Dom is now going to make sure the fire keeps burning. The fire spreading in the pyre. ISO 360, 70mm, f/5.0, 1/125s. Before long, most of the pyre is on fire. Notice the feet have become separated. ISO 200, 32mm, f/5.0, 1/250s. It takes three to four hours for a body to burn. The heat is unbelievable. 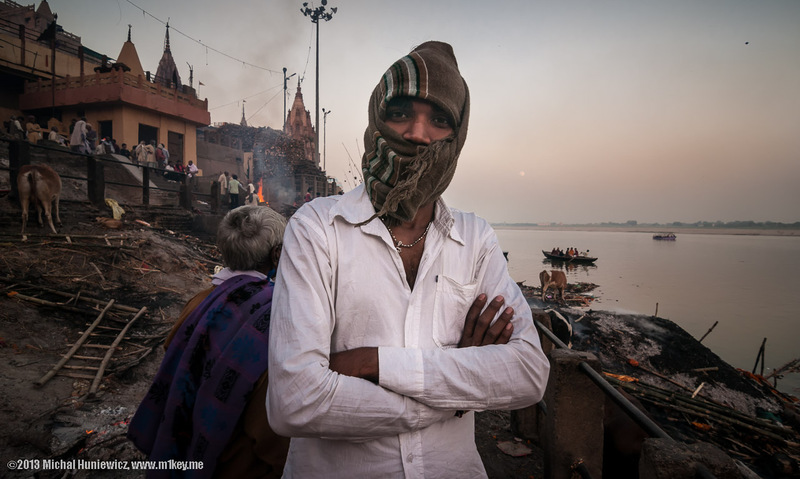 It is literally painful to walk near a burning pyre, and unlike every body else close to the fire, I had no face protection, and had to cover my camera with my hands. In India, touching people with your feet is considered disrespectful, and so is walking or jumping over them. 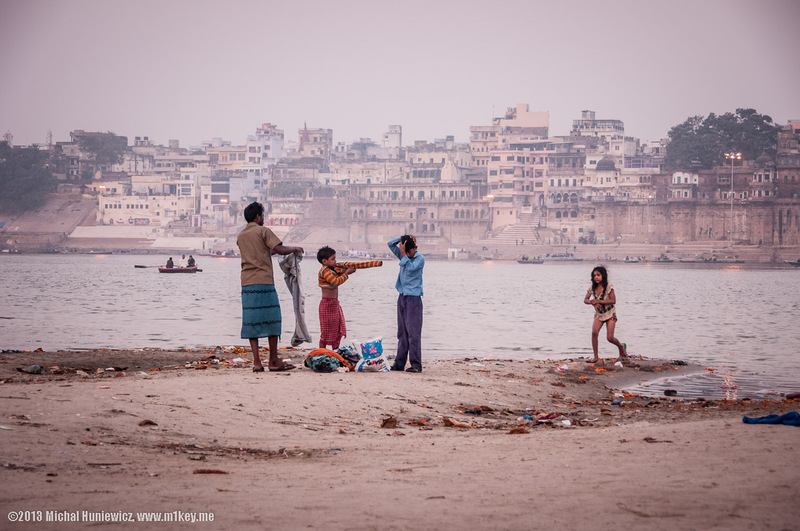 Unfortunately, I wasn't aware of that, and in Manikarnika Ghat I literally jumped over a dead body, because the area was very crowded and that was the only way I could go. ISO 360, 11mm, f/5.0, 1/125s. 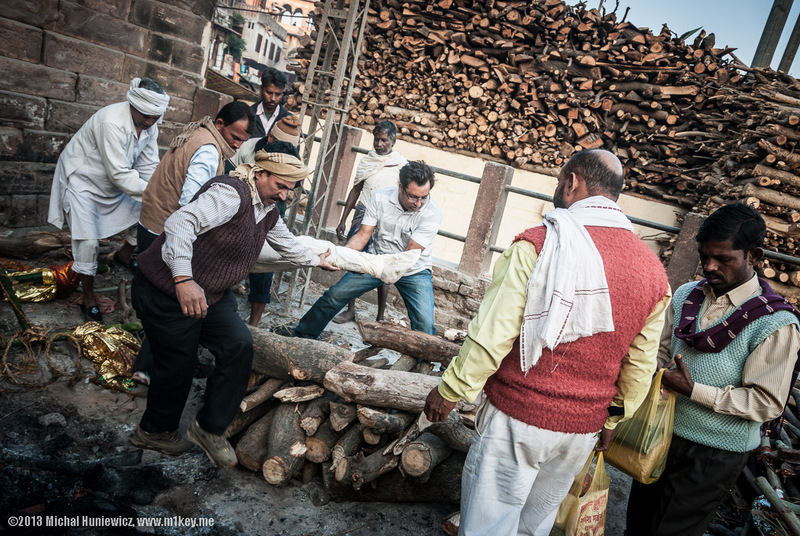 So long as there is enough wood, the Doms make sure every part of body is burnt. 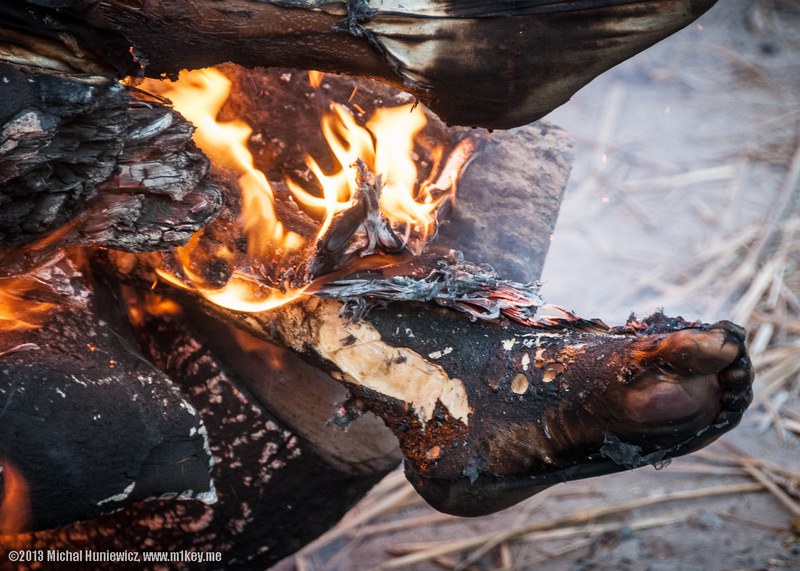 The feet often have to be added back to the fire, as they stick out of the pyre; and this is what is happening in this picture. ISO 640, 11mm, f/5.0, 1/125s. 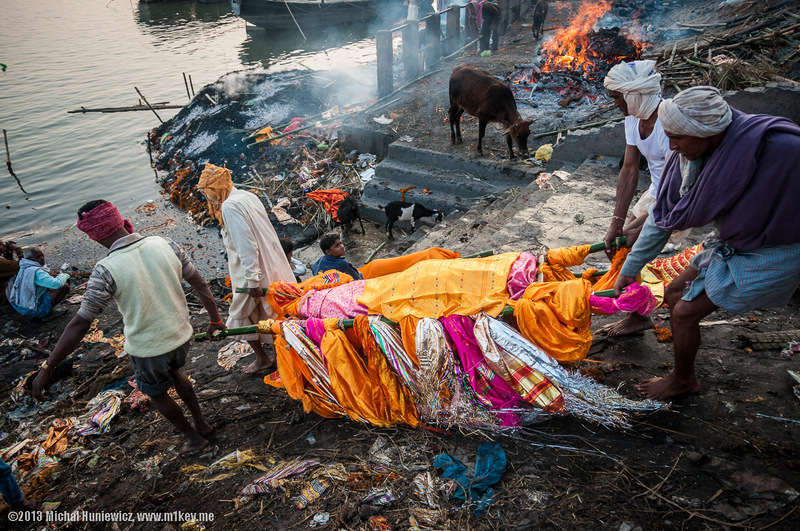 Once the cremation is finished, the fire is extinguished with water from the Ganges. 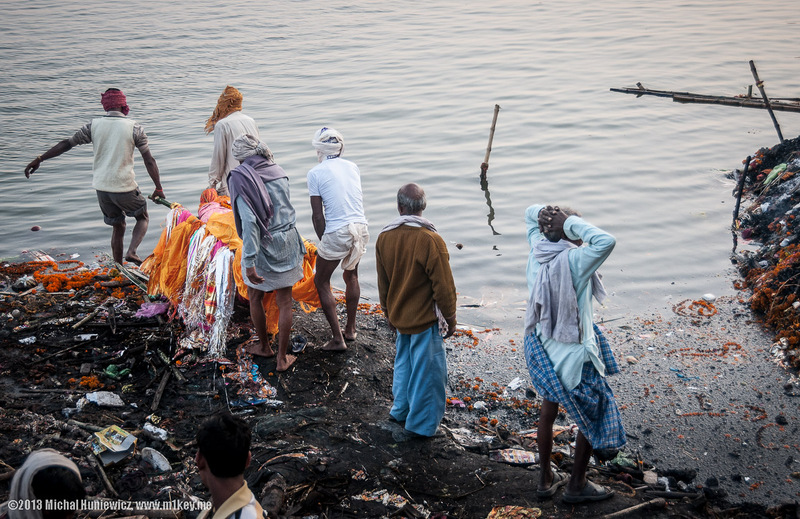 The ashes are collected and thrown into the Ganges. The process does produce quite a lot of half-burnt body parts, which also make it to the river. To solve the problem of dead bodies polluting the river, tens of thousands of snapping turtles were released into the river to devour human remains. 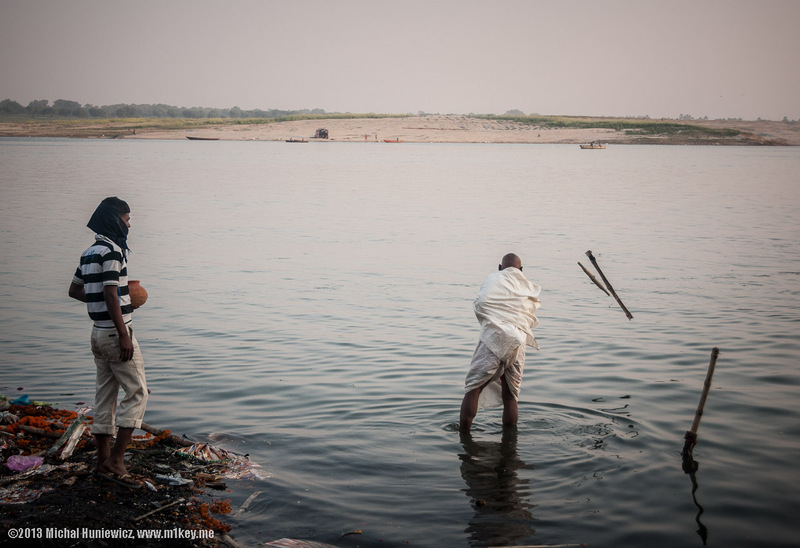 They weigh up to 35 kg, and are trained not to harass living people bathing in the Ganges. ISO 200, 34mm, f/4.2, 1/400s. 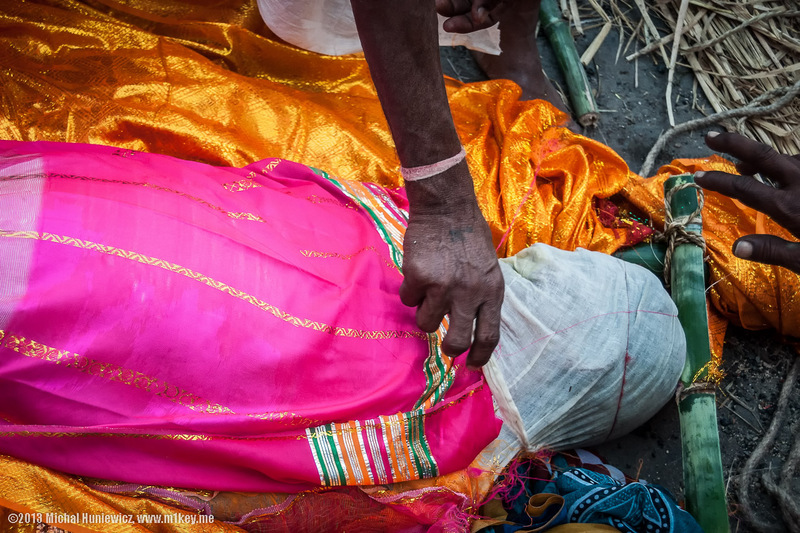 The bones that remain (as mentioned before, it is often the breastbone or the pelvis) are carried between two bamboo sticks, and then tossed into the river. 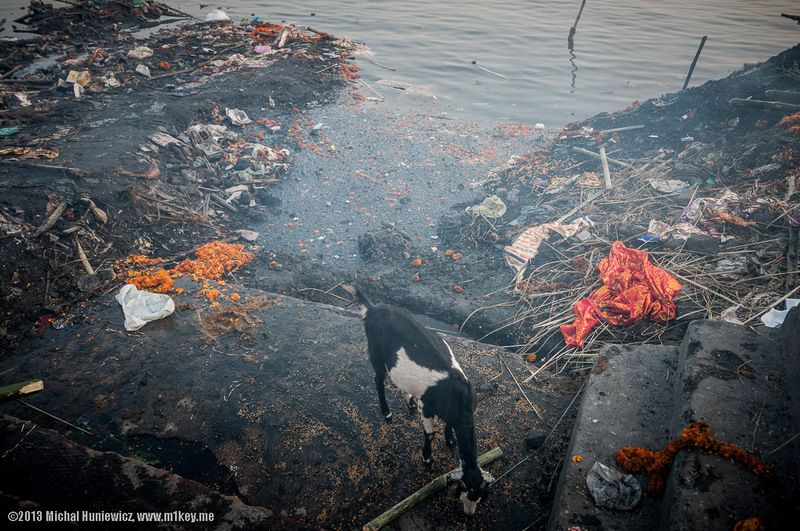 Sometimes they wash up right back at Manikarnika Ghat, and it is not rare to see a dog gnawing it calmly - which is considered auspicious. 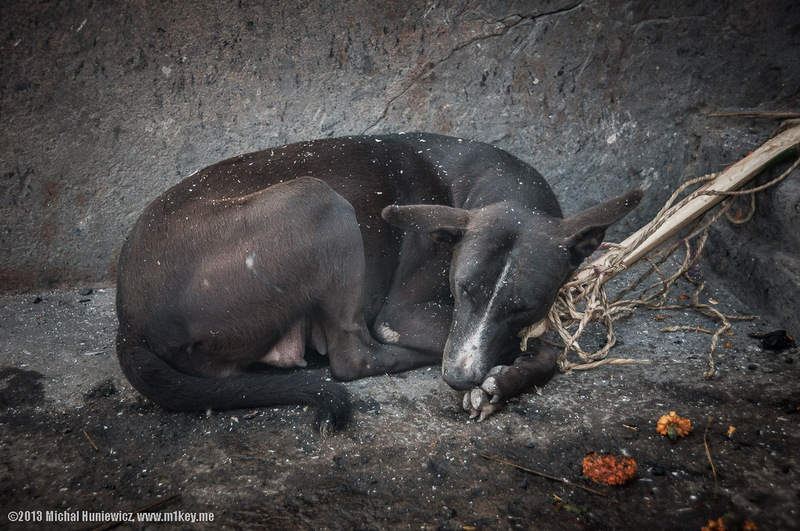 I, too, ended up covered in ashes, just like this dog. In fact, it was in my hair, my nose, my mouth, everywhere - I must say it made a rather strong impression on me, and I still remember the smell, the heat, and the atmosphere of that place. ISO 360, 35mm, f/4.2, 1/125s. 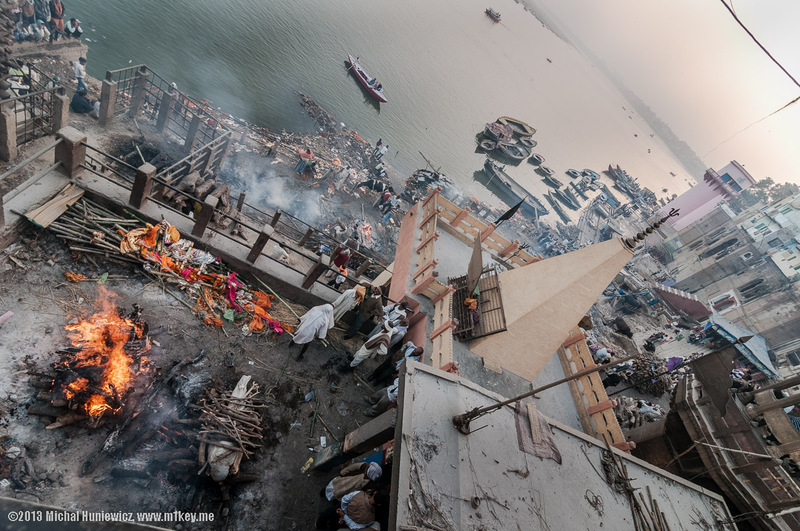 As a kid, I must have read about the Burning Ghat and created my own image of it in my head. I then forgot about it completely and only remembered again in Varanasi. The reality didn't quite match my imagination - there were fewer steps, and less steep, and the place wasn't as gloomy. 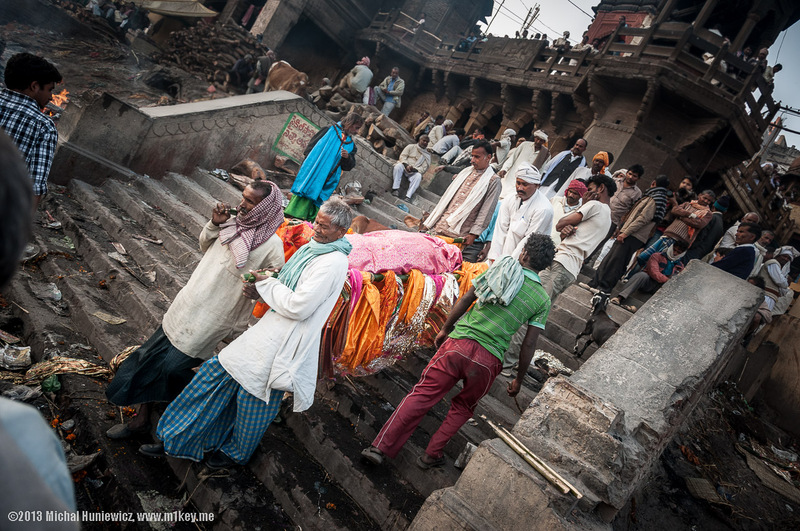 Not that I was disappointed, Varanasi is my #1 India location. 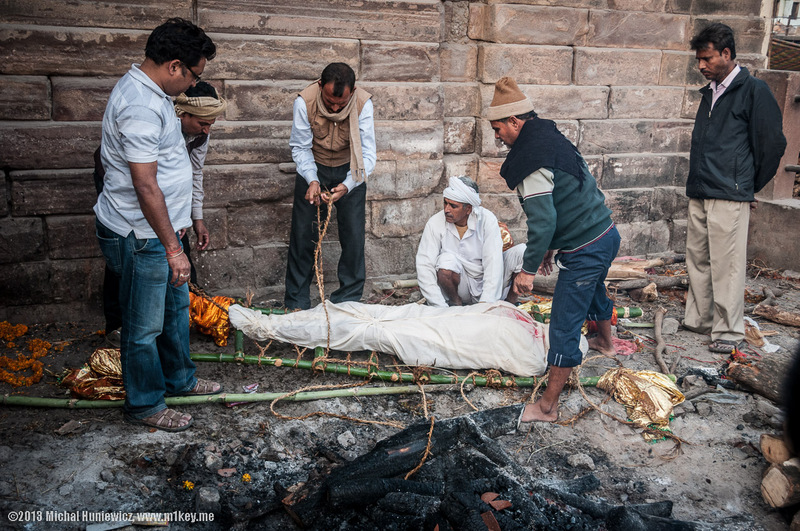 All of that makes Varanasi a very strange and enriching experience for a traveller; and it is striking how much the Hindu approach to death is different to the Western one. "It is a curious people. With them, all life seems to be sacred except human life." said Mark Twain. But was he right? Or is it that the Indians simply have the courage to look death right in the eye, the courage that we usually lack? I really don't know what to make of all this. ISO 280, 60mm, f/4.8, 1/125s.